The NASCAR Whelen Modified Tour (NWMT) returned to Oswego Speedway for the Toyota Mod Classic 150 presented by McDonald’s. The race program was moved up as heavy rain moved across the state of New York. Teams completed their practice with Doug Coby of Milford, CT. scoring the fastest time. There was a break while ISMA Super Modifieds were on the track and then NWMT drivers had their chance to earn the pole in group qualifying. In the last group session, Matt Hirschman or Northampton, PA brought the #60 Pee Dee Motorsports Chevrolet to the top of the charts with a time of 17.640 seconds to capture the Coor’s Light Pole Award. Moving things along, cars were lined up in the pits ready for racing. Cars, drivers and teams soon moved to the front stretch for pre-race ceremonies. Once completed, drivers strapped in and the pace laps began. Hirschman took the green flag and jumped immediately into position one with Patrick Emerling of Orchard Park, NY. falling in line right behind him. It was Hirschman’s race to win or lose as he maintained the lead position lap after lap. As the race unfolded, the #6 TS Hauler Chevrolet with Ryan Preece of Berlin, CT. dialed in. Preece was clocked as the fastest car on the track. He passed Timmy Solomito from Islip, NY. on lap 10 and made his presence know as he ran on Hirschman’s rear bumper waiting for a passing opportunity. Drivers pitted mid-race for the mandatory session, lined up where they left off and resumed racing. Hirschman continued his lead with Preece bearing down on him in his rear view mirror. On lap 118, Hirschman came up slightly high on the backstretch and provided the exact opportunity that Preece was looking for. Preece got under Hirschman enough to pass him in turn three. Preece then went forward to take the checkers with a 2.849 Margin of victory over Hirschman. 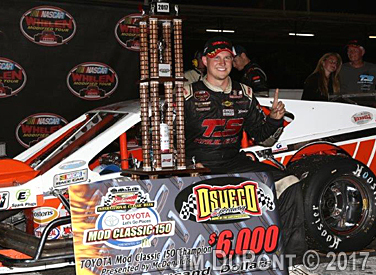 Preece has had five wins in his last ten starts with the NWMT tour so he is definitely a strong contender. “I am just trying to win and that is all that really matters. My motto is – ‘If you win races, it will take care of it’”. That is a great motto to have and hopefully Preece continues living the ‘Dream’. Doug Coby completed the race fourth, followed by Eric Goodale for fifth, Justin Bonsignore, Craig Lutz, Max Zachem, Dave Sapienza and Rowan Pennink rounded up the top ten. 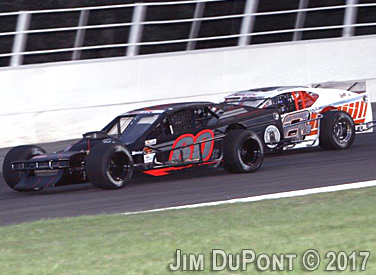 NWMT racing will continue in two weeks with the ‘Riverhead 200’ at Riverhead Raceway. What are your thoughts on this year’s NWMT point’s chase? 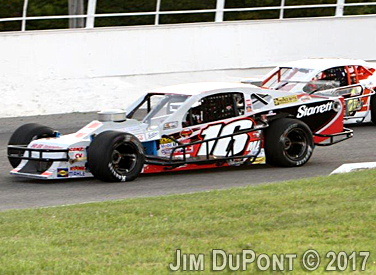 What is the difference between the ROC and Tour car at Oswego Speedway?